Over 100 years ago, a 10th-century copy of ancient writings by the famed Greek mathematician Archimedes was discovered in an Istanbul convent. But the handwritten copy had been scraped from the parchment, its mathematical theories scribbled over with prayers and illustrations. But, thanks to modern technology, the record of Archimedes' writings had not been effaced for good. When the parchment found its way into the hands of an anonymous, billionaire collector in 1998, William Noel—Curator of Manuscripts at the Walters Art Museum in Baltimore, MD—set out to convince the palimpsest's new owner to have the original writings studied, restored, and exhibited at the Walters. 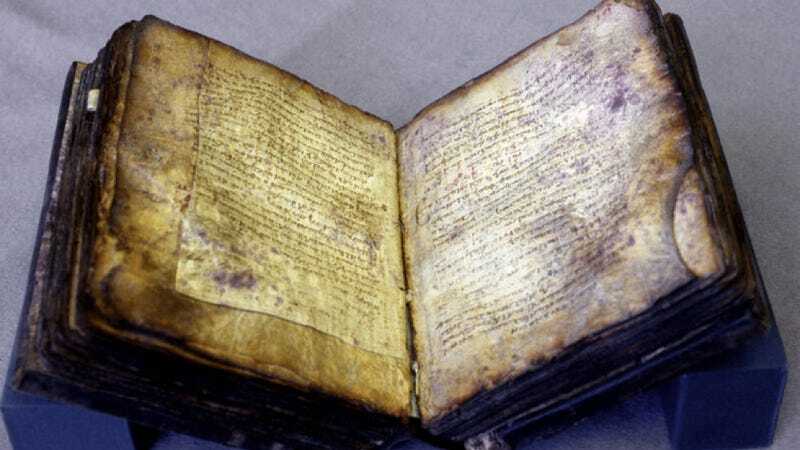 The purchaser not only handed the writings over to Noel, he actually funded their restoration, providing an international team of scientists and experts with the means necessary to divulge the ancient manuscript's secrets. Now, after receiving 12 years of meticulous attention in the form of research and restoration, The Archimedes Palimpsest has made its debut here: "Lost and Found: The Secrets of Archimedes." At the exhibition's start you come face to face with two leaves from the Palimpsest; all you see is a fragment of a ruined manuscript, charred, stained and inscribed with prayers. But lines of reddish text, scarcely visible, run perpendicular to those prayers. And you can also make out the ghost of a diagram, a spiral. Above these leaves a series of slides shows the same pages under colored lights, revealing various details. The juxtaposition neatly demonstrates the challenge posed by the Palimpsest and the technology used to explore it. The effort is made more complicated by the Palimpsest's nature. After being erased, each leaf was rotated 90 degrees and folded in half, one Archimedes page yielding two of the prayer book's. That book was apparently in use for centuries at the Monastery of St. Sabbas in the Judaean Desert. Its towers peek out of the rocks in one of David Roberts's otherworldly Holy Land illustrations from 1842, shown here. But by then the book was gone. In 1844 a biblical scholar happened upon it at the Metochion of the Holy Sepulcher in Istanbul and saw the curious mathematics underneath; a leaf from the book was found in his estate and deposited at Cambridge University Library. Then, in 1906, the Danish Archimedes scholar Johan Ludvig Heiberg saw the book in Istanbul and recognized seven treatises by Archimedes behind the prayers, making it the oldest source for his writings in existence and the sole source for two unknown works, "Method" and "Stomachion." Heiberg deciphered much of the text and took photographs that he worked on in Copenhagen. It was assumed that Heiberg discovered all there was to find out, which may be one reason that, when the battered volume was put on sale almost a century later, few buyers were panting after its riches. Read more about the last 100 years of the Palimpsest's epic journey, and the extent of the restoration required to return the manuscript to its present form, over at The New York Times.